A google translate . Be-aware google translate can be a bit erratic. Nabire, Jubi - Six members of the West Papua National Committee (KNPB) Region Nabire arrested and taken forcibly Nabire Police for no apparent reason. Region KNPB spokesman Nabire, Nus Degei to Jubi, Saturday (12/17/2016), said the arrests occurred on Friday at 09:00 local time. "Those four people were arrested when it comes to the police station put a notice that according rencara peaceful demonstration will be conducted on Monday (19/12) to request support West Papua becoming a full member of MSG," said Nus when met Jubi. According to Nus, four of his friends were immediately ditanghan and thrown into the cells so come to submit the notification letter. "Any one of them? We were disappointed with the actions of the authorities without cause immediately catch it. " Nus added, in the same day (Friday) at around 13:00 KNPB two members were also arrested in a raid on the home of a resident named Zadrak Kudiai (30) by Nabire police officers. "They (officials) came with a 2 car, approximately 8 people. And they brought two friends and two motor units, "said Nus while stressing that the actions of the officials could not they receive. "We just want to express our right of expression in the form of a peaceful demonstration, were arrested without any explanation why?" Said Nus again. Currently, the six members of the KNPB in Nabire police station and could not be visited. The sixth person was Andreas Kadepa, Elisa Pigome, Yohanis Tatogo, Yeimo Otis, Sam Nelligan Madai, and Zadrak Kudiai. Separately, activists and human rights defenders to the Jubi Yones Douw from Nabire also confirmed the arrest. "Members KNPB come Police enter the letter into the part of the obligations of the Act, but they were arrested," Douw said, adding that it was written that the message is not permitted to visit the victims. "Catching still go on, even though the Government of Indonesia has received 9 recommendations of the Universal Periodic Report (UPR) of the UN Human Rights Council on human rights violations in Papua," Douw said. Nabire Police Chief Adjunct Senior Commissioner Ronny Semmy Thabaa, reportedly were outside the area and until now could not be questioned. A google translate. Be-aware google translate can be a bit erratic. Wamena, Jubi - Papua independence movement will be holding a rally right at the commemoration of 55 years of events (Tri Komando Rakyat) Trikora December 19, 1961 and the meeting of the Melanesian Spearhead Group (MSG), which is planned on 20-23 December 2016. 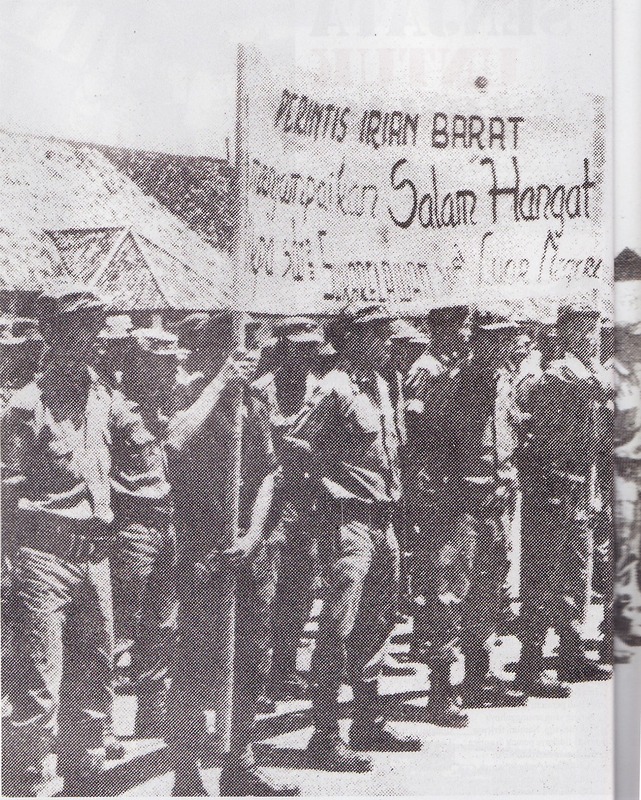 When the state Indonesia Trikora interpret as an important momentum seizure of West Papua from Dutch colonizers hand, but for the Papuan independence movement Trikora actually be regarded as the beginning of the annexation of West Papua to Indonesia and Papua causes of human rights violations that have an impact on the extinction of the nation of Papua. 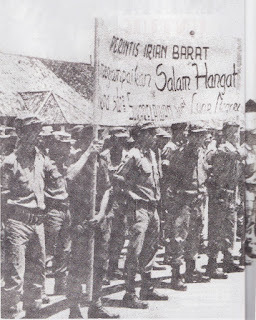 Thus, according to this movement, full membership at MSG West Papua, an important recognition once rescue national identity Melanesian West Papuans have been destroyed by the events they refer to as the annexation. "December 19 is to coincide with the annexation of West Papua or dikumandangkannya Trikora as the beginning of the robbery, the murder of human rights violations in Papua. This action is also a form of support to the people of Papua ULMWP to be accepted as a full member of MSG, “said Dominic Surabut, the committee secretary peaceful protest December 19 to Jubi by phone in Wamena on Thursday (15.12.16). The action, which will be held by the United Liberation Movement for West Papua (ULMWP) as a responsible and carried out by three factions Papuan independence movement, namely WPNLC, NFRPB and PNWP in the region Lapago be concentrated at the Football Kama Wamena. “We the people of West Papua endangered originated from Trikora 1961 issued by President Sukarno, then the action on December 19 at the two moments (Trikora and support MSG), we demand the right to life of the people of Papua through full membership ULMWP in MSG as a solution to rescue the people of the nation of Papua from extinction, "said Dommi. Similarly, the Chairman of the Regional KNPB Lapago, Simeon dabby also confirmed that the momentum of December 19 is important for the history of the nation of Papua. "Trikora December 19, 1961 made after the Manifesto of Papuan political December 1, 1961 as a milestone for independence, but Soekarno 'annex' territories West Papua, and since then thousands of West Papuan people were slaughtered, killed, tortured in various military operations conducted by the State against the people of Papua west "Simeon said while confirming that the KNPB back will mediate joint action on December 19 that, as at 10 December.